Should we drink bottled water? Plastic bottles of water are displayed at a store in Tokyo. 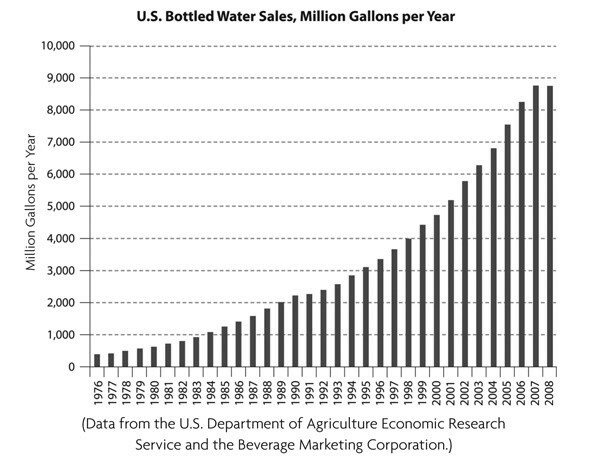 Over the last 15 years, the bottled-water industry has experienced explosive growth, which shows no sign of slowing. In fact, bottled water – including everything from “purified spring water” to flavored water and water enriched with vitamins, minerals, or electrolytes – is the largest growth area in the beverage industry, even in cities where tap water is safe and highly regulated. This has been a disaster for the environment and the world’s poor. The environmental problems begin early on, with the way the water is sourced. The bulk of bottled water sold worldwide is drawn from the subterranean water reserves of aquifers and springs, many of which feed rivers and lakes. Tapping such reserves can aggravate drought conditions. But bottling the runoff from glaciers in the Alps, the Andes, the Arctic, the Cascades, the Himalayas, Patagonia, the Rockies, and elsewhere is not much better, as it diverts that water from ecosystem services like recharging wetlands and sustaining biodiversity. This has not stopped big bottlers and other investors from aggressively seeking to buy glacier-water rights. China’s booming mineral-water industry, for example, taps into Himalayan glaciers, damaging Tibet’s ecosystems in the process. Much of today’s bottled water, however, is not glacier or natural spring water but processed water, which is municipal water or, more often, directly extracted groundwater that has been subjected to reverse osmosis or other purification treatments. Not surprisingly, bottlers have been embroiled in disputes with local authorities and citizens’ groups in many places over their role in water depletion, and even pollution. In drought-seared California, some bottlers have faced protests and probes; one company was even banned from tapping spring water. Worse, processing, bottling, and shipping the water is highly resource-intensive. It takes 1.6 liters of water, on average, to package one liter of bottled water, making the industry a major water consumer and wastewater generator. And processing and transport add a significant carbon footprint. The problems do not stop when the water reaches the consumer. The industry depends mainly on single-serve bottles made from polyethylene terephthalate (PET), the raw materials for which are derived from crude oil and natural gas. In the 1990s, it was PET that turned water into a portable, lightweight convenience product. But PET does not decompose; and, while it can be recycled, it usually is not. As a result, bottled water is now the single biggest source of plastic waste, with tens of billions of bottles ending up as garbage every year. In the United States, where the volume of bottled water sold last year increased by 7% from 2013, 80% of all plastic water bottles become litter, choking landfills. Of course, higher rates of recycling could improve this situation substantially. For example, Germany has successfully promoted recycling with a combination of smart regulations and incentives, such as machines at supermarkets that return deposits in exchange for bottles (often brought in by the poor). But recycling entails the use of even more resources. Some might argue that the safety and health benefits of bottled water offset these environmental consequences. But those benefits are little more than a marketing ploy. Although tap water in the West occasionally has quality problems, so does bottled water. The industry’s own production process sometimes causes contamination and forces major recalls. Indeed, tap water is often healthier than bottled water. Chemical treatment means that processed bottled water may lack fluoride, which is naturally present in most groundwater or is added in tiny amounts to municipal water supplies to promote dental health. There are also health concerns over the potential leaching of chemical compounds from PET bottles, as well as from the large reusable polycarbonate containers in which bottlers deliver water to homes and offices. Suboptimal storage conditions – which include, for example, prolonged exposure to sunlight and heat – can cause potent estrogenic activity in bottled water, exposing consumers to chemicals that alter the function of the endocrine system by mimicking the role of the body’s natural hormones. To be sure, these consequences are not going unnoticed. In the US, environmental concerns have prompted some university campuses and at least 18 national parks to ban the sale of bottled water. The bottled-water industry sees the danger as well – and is doing everything possible to keep public opinion on its side. To that end, big water bottlers like Nestlé, PepsiCo, and Coca-Cola Company have taken a page out of the playbook of energy behemoths like ExxonMobil, BP, and Shell, by pursuing “green” initiatives. But make no mistake: Bottled water is compounding the world’s resource and environmental challenges. It is making it harder to deliver potable water to the world’s poor. It delivers no health benefits over clean tap water. And it does not even taste better; indeed, blind taste tests reveal that people cannot tell the difference between bottled and tap water. Obviously, tap water needs an image overhaul. Unfortunately, it lacks the marketing muscle and advertising budgets that have powered the dramatic growth of the bottled-water industry. When a product that is cheaper and better does not prevail, that is bad news for consumers. When the product is water, we all lose. Can graphene make the world’s water clean?